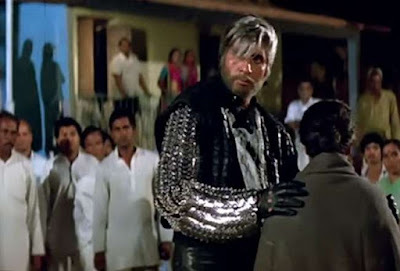 Shahenshah Dialogues - Get the best dialogues of Amitabh Bachchan from Shahenshah movie. This is an action film was released is 1988. The film was produced and directed by Tinnu Anand. Amitabh Bachchan played the title role, along with Meenakshi Sheshadri. The story of the film was written by Amitabh Bachchan's wife Jaya Bachchan and the screenplay was written by veteran screenwriter Inder Raj Anand. The film became the second highest grossing film of 1988. The film is remembered for the famous dialogue "Rishtey mein hum tumhare baap lagtey hai...Naam hai Shahenshah". The film is full of amazing dialogues and lines, some dialogues are really awesome, Here we have collected all the famous dialogues of Shahenshah Movie. "Mujhe malum hota aaisa kalank mere ghar mein paida hone waala hai ... Toh main apne nakhoon se apni kokh phaad daalti"
"Har reporter ki tarah meri ragon mein bhi khoon ki jagah roshni behti hai ... Aur jab tak woh roshnai behti rahegi ... Mera kalam sachai likhte hue kaanpega nahi"
"Chaand ko apni chaandni sabit karne ke liye ... Chiragon ki shahadat ki zaroorat nahi padhti"
"Joh baant ke khaate hai ... unki sehat achchi aur umar lambi hoti hai"
"Aaj sharaab ki lehren baha do ... Joh bhi aaye tumhare bar mein usse whiskey se nehla do"
"Yeh sachai ka bazaar hai ... yahan usool na beche jaate hai ... na khareede jaate hai"
"Budhapa jab jawani ka intezaar karta hai ... toh bahut intezaar karta hai"